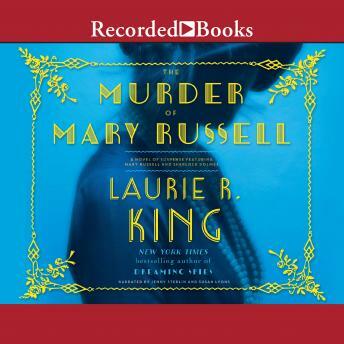 Laurie R. King's bestselling Mary Russell-Sherlock Holmes series weaves rich historical detail and provocative themes with intriguing characters and enthralling suspense. Russell and Holmes have become one of modern literature's most beloved teams. But does this adventure end it all? Mary Russell is used to dark secrets-her own, and those of her famous partner and husband, Sherlock Holmes. Trust is a thing slowly given, but over the course of a decade together, the two have forged an indissoluble bond. And what of the other person to whom Mary Russell has opened her heart: the couple's longtime housekeeper, Mrs. Hudson? Russell's faith and affection are suddenly shattered when a man arrives on the doorstep claiming to be Mrs. Hudson's son. What Samuel Hudson tells Russell cannot possibly be true, yet she believes him-as surely as she believes the threat of the gun in his hand. In a devastating instant, everything changes. And when the scene is discovered-a pool of blood on the floor, the smell of gunpowder in the air-the most shocking revelation of all is that the grim clues point directly to Clara Hudson. Or rather to Clarissa, the woman she was before Baker Street. The key to Russell's sacrifice lies in Mrs. Hudson's past. To uncover the truth, a frantic Sherlock Holmes must put aside his anguish and push deep into his housekeeper's secrets-to a time before her disguise was assumed, before her crimes were buried away. There is death here, and murder, and trust betrayed. And nothing will ever be the same.